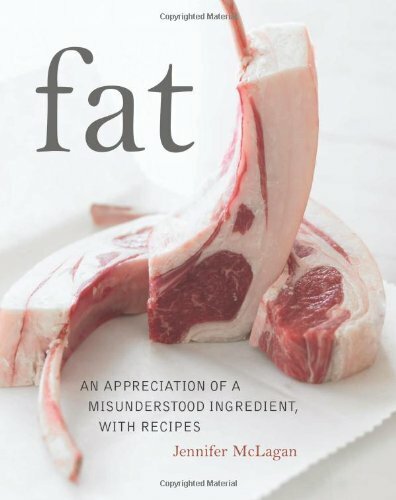 A book all about healthy fats? I'm in love with this book. No, seriously, it's amazing. Fat: An Appreciation of a Misunderstood Ingredient, with Recipes by Jennifer McLagan is an ode to a vilified and much forgotten part of our food that deserves a resurgence. Her main motivation for writing the book is that, "There are stacks of cookbooks that tell us how to cut fat, lose the fat, and cook without fat, but none tells us how to enjoy fat." Below is a chart, with information taken from the book, of the common varieties of animal fat and their fat content. If you look at beef and butter fat you'll be able to tell why Paleo-centric people often recommend them as dietary staples. Their extremely high saturated fat content compared to extremely low polyunsaturated makes them ideal for burning as energy, and building the cells in our bodies and brains. I've been using it as a reference which has been helping me keep a working knowledge of what I'm getting from the animal fat in my diet. Hopefully you'll find it useful too! The numbers don't always add up to exactly 100% because of water and other solids. This book will answer many of your questions about why the right kinds of fat are extremely good for you. If you want a deeper look into the arguments for eating saturated fat and cholesterol, as well as an in depth history of how the medical establishment moved to recommending low fat diets check out Why We Get Fat: And What to Do About It, by Gary Taubes, which is pretty much the definitive text on the subject for our current understanding. I love that side-by-side comparison of the composition of the fats. Quantifies how beef fat and butter are much better than poultry and other fats for saturated fat content! Totally! When I get plenty of healthy fat I feel awesome and I've kept losing weight and putting on muscle.